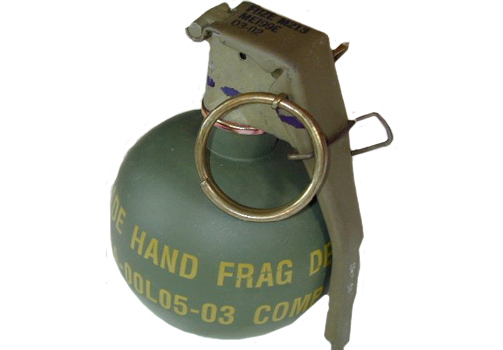 The M67 hand grenade uses a time fuze and is thrown by hand. The steel body (63.5 mm dia.) breaks up on detonation and generate a large number of lethal fragments. The grenade is activated by a conventional striker using an M42 percussion primer. The M213 pyrotechnic delay fuze provides a 4 to 5 seconds delay. The grenade weighs approximately 390 gr and the average throwing range is 40 meters. Its lethal radius is approximately 15 meters. Soldier prepares to throw M67 Fragmentation Grenade (left). M67 Fragmentation Grenade Explosion (right).